Looking to become a pharmaceutical sales representative for Merck? To prepare for your video and personal interview, practice with our interview pack. Practicing our personality test, Sienna Reasoning Test (SRT), and situational judgment test will help you get a step closer to getting the job. During the hiring process for the Merck pharmaceutical sales representative job, you will probably be required to complete a video interview before your face to face interview. You may also be asked to take an online Siena Reasoning Test. Improve your chances of being the next Merck employee by starting to use our Merck Sales preparation now. The logic-based reasoning is at the heart of the SRT. The exam items mirror the same logical thought processes as those that are needed for effective job performance. No prior knowledge of the subject matter contained in the various passages presented is necessary for answering any test questions. JobTestPrep has developed an SRT preparation system that includes practice tests with Q & A analysis, study guide and helpful exam strategies, all of which contribute to successful Siena Reasoning Test results. Warm up for the Merck Sales Representative Test Online! JobTestPrep offers dozens of highly effective preparation materials to help you successfully pass your Merck Sales Representative assessment tests. Our PrepPacks™ were designed to improve your chances of successfully landing your dream job. You will be able to quickly identify and eliminate any weaknesses prior to taking your Merck Sales Representative assessment test through using JobTestPrep. The hiring process for a Merck pharmaceutical sales position has four to five stages. After submitting your résumé, you may be asked to complete the online Sienna Reasoning Test. 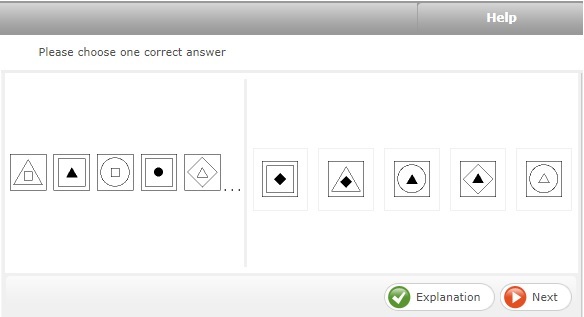 You may also be asked to complete further online behavioral tests, such as situational judgment and personality tests. Upon successfully completing the tests, you will participate in a phone interview. After passing the phone interview, you will be invited to participate in a face to face interview with several managers. The most common type of online test you will encounter in the Merck hiring process is the Siena Reasoning Test (SRT). In addition, you will probably be asked situational judgment and personality questions relevant to the Merck harmaceutical sales representative position. Improve your chances of excelling in the assessment stage by utilizing JobTestPrep's practice tests. After you successfully pass a phone interview, you will be required to take the Merck’s pre-employment tests. Provided you receive high scores on them, you will move to the next level of the pre-employment assessment, an in-person interview. This interview is usually conducted in one of the Merck’s locations. On it, you will have a chance to talk with your prospective managers, who will ask you about your working experience and your career goals. They will also want to determine whether you have required skills to perform job tasks well and whether you will be a good fit for the company. Situational questions will also be posed. Before you come for the face-to-face interview, think about a problematic situation you faced in your past and recollect what steps you took to resolve it. Your recruiters will want to know what goals you set for yourself, while coping with the difficult situation, and what remedy you found for it. Tell them also about possible alternative resolution of the problem that your weighted but finally decided not to implement. By following these steps, you will show to the Merck’s employers how your mind works in stressful situations. Tell us about a stressful situation and how you handled it. Give an example of a time you had to collaborate with other teams or lead other teams. Give an example when you faced a complex problem and how you resolved it. What should I emphasize during my interview? Typically, you should emphasize why you are the best candidate for the job. You should bring in good examples from past experiences to show that you have the skills needed to succeed. Use the STAR method to answer questions as this provides a complete picture and is an engaging way to answer. What possibilities for advancement exist within Merck? Merck has several promotion options; one of the most desired programs is the GMAP – General Management Acceleration Program, in which you interact with leaders all over the world and make a meaningful impact on the company.